The PERFECT addition to turn your Smartphone into a full fledged Gamepad! PERFECT for those long rides on trains, planes and automobiles! 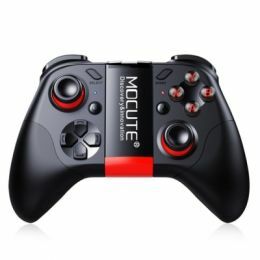 The 2018 Wireless MOCUTE 050 VR Gamepad is a FULL-FEATURED Gamepad with 14 buttons, 2 joysticks, and a directional pad. Finally, a full Gamepad without limits for mobile devices! 1). We Offer Stellar Customer Service backed by a 100% Customer Satisfaction Guarantee! 4). We are constantly searching the world for the latest and greatest, coolest gadgets and gizmos to offer our Customers!